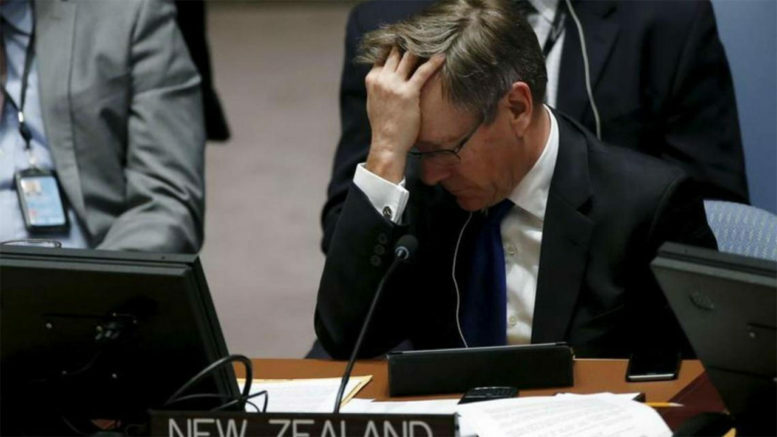 Since the passing of anti-Israel UN Resolution 2334 on Christmas Eve last year, co-sponsored by New Zealand, there have been questions about what kind of mandate the Foreign Minister had and the level of prior advice and knowledge of the Government. Questions about New Zealand’s involvement in the passing of the Resolution were raised this week by Winston Peters in parliament. Peters asked Gerry Brownlee, standing in for the Foreign Minister, whether the resolution had been put before cabinet. Brownlee obfuscated for five minutes or more and failed to answer the question, but he gave the impression that it did not go to cabinet, as procedure demands. While it’s still something of a mystery how much the New Zealand government knew about the genesis and passing of Resolution 2334, a talk on 9 March 2017 by Gerard van Bohemen to the New Zealand Institute of International Affairs shed light on some diplomatic maneuverings on this issue and showed how New Zealand was a driving force behind the anti-Israel resolution. Ignoring requests to shift focus away from the Israeli/Palestinian conflict and toward genocides and raging civil wars, New Zealand convened Council members to discuss how they might do ‘even a little something’, proposing the New Zealand-drafted resolution once more. However, Palestinians were not happy ‘that a non-Arab country was running a resolution on an Arab issue’ and preferred that it be tabled by Egypt. McCully’s response in the morning – with or without cabinet approval – was, “yes, we’ll support it. It’s straightforward, consistent with our policy and you can co-sponsor it.” However, far from being ‘straightforward’, the resolution was a significant departure from previous resolutions and New Zealand policy, as Shalom.Kiwi has described here, here, here, here, and here. Nevertheless, New Zealand co-sponsored the resolution, along with Venezuela, Senegal and Malaysia. Ambassador van Bohemen explained, ‘we didn’t have to sponsor it…we volunteered’. And when Egypt pulled out from putting the resolution to the vote only a few hours later, New Zealand and the other three co-sponsors stepped in to make sure it would be voted on – choosing to follow seldom-used procedures of the UNSC. Many New Zealanders also hope that we can move past this point and restore a positive relationship. However, many would disagree with the view that the ball is in Israel’s court. The Israeli withdrawal of their ambassador was in response to New Zealand’s choice to sponsor an anti-Israel resolution that excoriates and delegitimises an ally and the only democracy in the Middle East. If it’s not in New Zealand’s interests to have a bad relationship with Israel, as van Bohemen says, this should have been considered before sponsoring the resolution. This action has likely harmed chances of Israeli political support for any NZ/Israel agreements, such as the innovation deal worth an estimated $2b between Australia and Israel. Resolution 2334 would, however, have garnered favour with the Organisation of Islamic Cooperation and Non-aligned countries. It is no secret that New Zealand has been busily pursuing trade opportunities with Saudi Arabia, Iran, and other OIC members. Or it might just have been a naive attempt to secure a personal legacy on the part of McCully. Either way, the single focus on a trophy resolution that lacks historical accuracy, balance and fairness, hardly befits a body with the responsibility of the Security Council. Rather than promoting dialogue between the parties, McCully’s legacy has simply made the chances of peace more remote. In effect, his easy goal may prove to be an own goal.